Well I have found the perfect combination. Gangster on a giant dragon Kriss 2 blade. Fantastic control and the gangster is brilliant. Opponents just can’t cope with it. Sorted . The reviews sound great, thinking about ordering a sheet, just wondering, as I've heard nothing about it, can you chop away from the table with it? I would say that it depends on your blade to some extent, but speaking for myself, I find that chopping away from the table doesn't exactly maximize the Gangster's characteristics, in that you're going to get more backspin with other rubbers, and I personally do find it to be a bit more finicky than some other rubbers about getting the right blade angle, etc., on chops. A friend of mine who is a close to the table blocker, using an oversized defensive blade (Toxic 5) got a sheet. I had a session against it, and it seemed to work really well for him. When I gave him a hard loop, the ball came back on a very low trajectory that was very difficult to handle. It doesn't give the most spin reversal, but it was very controllable for him. It seemed like the harder I looped, the better it performed. When I slowed things down a bit, he had a little more trouble. He handled serves better with this rubber also. He had been using the Viper, and he found Gangster to be a little slower and more controllable, with a lower throw angle on blocks. I used to use the Viper and switched over to the Gangster (which I'm very happy with for now), and this is consistent with my impressions. The Viper has a tiny bit more spin reversal, I think, but the Gangster more than makes up for it by keeping the ball very low and short. Also a bit easier to attack with. Can anyone compare it to Dornenglanz? I used Dornenglanz only briefly, but based on my memory of it, the Gangster has softer pips and is therefore more dynamic in its effects. They both keep the ball pretty low, though maybe the Gangster keeps it shorter. Spin reversal is similar, with, perhaps, a slight advantage for Dornenglanz, though I could be mistaken about that since it's been awhile. To me, Dornenglanz was a bit too predictable, which meant I kept getting the ball back on the table, but after a bit, most good opponents knew what was coming, so I felt limited. Don't have that problem with the Gangster. One note: if you chop, as opposed to chop-block, the trajectory of the ball with the Dornenglanz was a bit lower, as I recall. (You can keep chops low with the Gangster too, but there's less margin for error.) Finally, Gangster is more durable. Thanks TraditionalTradesman, sounds like it's worth a try at least. The ability of the Gangster to keep the ball short is really what gave me the most trouble. On really hard loops, it would come back long enough to re-loop, but the sharp low angle and placement was tough. On anything that wasn't very hard hit, especially with his slow blade, it came back short, many times not off the end of the table. Especially on serves, it made it difficult to get a long enough return back to really get a hard third ball loop at him. I would agree, it felt like there was a little less reversal than the Viper. I can't speak to attacking capabilities, as he doesn't ever attack. Here's a shocker. I've been testing this and all the claims in the description are pretty much true! I stuck it on one of my Barricade blades and it felt good right from the start. Great control. Good spin reversal. Perfect speed. Takes spin well. Takes hard hits well. Attacks well. Can execute all the normal long pips shots. Made some unforced errors due to not being used to it yet, but not that many. My initial impression is for my game style this seems to be the best friction long pips I've tried so far. Don't know about the durability or whether I'll still love it in a month, but for now I can't wait to practice more with it. GANGSTER is a new long pimple rubber that provides added value in a variety of fields. GANGSTER was developed 100% for use with the new plastic ball. The rubber enables to produce an effective blocking game close to the table, both while blocking passively and while chop-blocking. All standard attacking strokes with long pimples can be performed easily, even for less experienced players. GANGSTER mostly excels through its great control at all levels, this holds true for service returning, pushing over the table and even blocking against fast topspin shots. 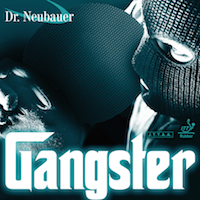 GANGSTER: A highly interesting alternative for all close to the table long pips players! How is the geometry? Are the pips close to 2 mm long? How wide and how far apart are they? For the majority of this review, I'll be comparing this rubber to Viper as it directly comparable. On visual inspection the pips are in horizontal orientation, the pips themselves are wider then Viper and are wider spaced as compared to Viper. The pips are mildly harder then Viper but are still soft. Gangster is a slower more controlled version of Viper with the expected pros and cons associated with increased control and decreased speed. Control: Better then Viper, this LP feels very safe in use, easy all round use such as retrievals, chop blocks and attacking. Speed: Slow. Noticeably slowly then Viper. Serve Return: Good, very similar to Viper. Deception: Somewhat less then viper but still adequate. Reversal: Minor decrease compared to Viper, still very good. Chopping: Good close and mid distance from the table, Increasingly difficult the further away from the table due to decreased speed. Blocking: Easy and very controlled. Chop Blocks: Easy due to high control and slow speed, not as dangerous as Viper but still good. Attacking: Attacking backspin balls is very easy with Gangster due to the high control and spin reversal. It is noticeably easier playing aggressive shots then with Viper but the slow speed of the rubber really negates some of this advantage. In Summary I have found Gangster to be a slower more controlled version of Viper. With the increase in control there has been a subsequent reduction in deception and spin reversal however not too much. It is a very easy to use LP for nearly all shots from defense, blocking and attacking!! Lots of fun!! Hard to measure precisely, but I'd say the pips are around 1.7mm long. Pips + rubber sheet together = around 2mm. They are about 1mm apart, and I'd say they're on the narrow side, though maybe not as narrow as something like D.Techs. I’m very intrigued about the previous review against the Viper particularly in respect to the reversal and distruptive element. Stated the difference is marginal. how on earth can you judge marginal reversal and or distruption it all depends on the opponent and even then marginal differences can be almost impossible to quantify. That having been said I have played with both rubbers and I would say Gangster beats viper in all departments. I suppose that’s the beauty of Table tennis everyone’s playing characteristics are different and therefore a rubber will react accordingly otherwise there wouldn’t be thousands and thousands of different set up combinations. One mans gangster is another mans viper! Pips seem fairly soft which I like... I don't like that it has the glue sheet.. Will try to remove that..